It's time for our 11th Annual BEER CHEESE FESTIVAL presented by Shop Local Kentucky. Saturday JUNE 8th. We are again looking for volunteers this year. If you are interested then you have landed at the right place! We are looking for indviduals, church groups, school groups and all the above! It is a great community day and we invite you to come join the fun. Why not ask your friends and family to come along? Each volunteer will receive a FREE festival t-shirt along with a complimentary Beer Cheese pass allowing you to stroll the beer cheese tasting area and sample from all our vendors. 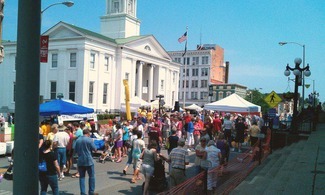 The Beer Cheese Festival is a fundraiser for Main Street Winchester, an organization dedicated the revitalization of beautiful, historic downtown Winchester. Meet at info booth to assist in vendor set up. Help with the seeling of Beer Cheese merchandise.